I won't deposit on a site simil-PD until it's proven the owner can handle my money. Who is that guy? where are you getting this from. I have no relation to the guy mentioned above. Click the 'gift' icon in the lower right corner. The "profit on win" box isn't always updated correctly. I just bet 4194 satoshis at a 1.10x multiplier, and won 419 satoshis, as expected, but the "profit on win" box shows 1719 satoshis, which is wrong. I can't find a way to reliably reproduce it, but sometimes when I type in the "win chance" box and then click in another box nothing updates. A bankroll made of dust. When you make a bet of 0 it tells you the current bankroll. You are being busted from many sides. Are you in a kindergarden ? We're moving funds around, please wait for legit people to testify. Jesus. When you have scammed me right. Or do you think I have forget the 0.01? 3 minutes before you had 20 btcs in your bankroll but when I bet 0 it says other thing. In summary, are you gonna send me my 0.01 back or not? Is this the bitcoin community we want? 4. if I can only claim every that many seconds, that's around every 68 years! I also noticed there's no "client seed" involved in the game. The site decides what number you're going to roll and you have no way to affect it. 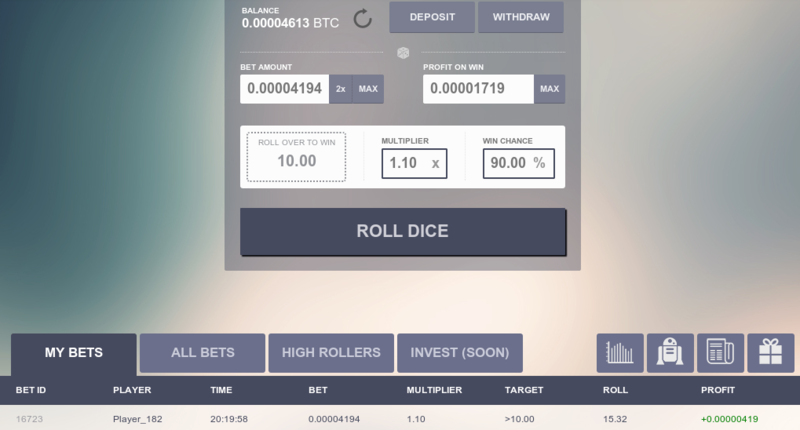 The site proves that it decides before you roll, but if it sees you are playing "over 95" say, it can decide to give you a lot of numbers over 95 and there's nothing you can do to change it. That's why every legitimate dice site lets the player specify part of the seed. I recommend against playing on any site that doesn't let you specify a client seed. its better if you fix somethings starting with faucet and then with client seed! also i think your max bet is still too big for your current site! Dooglus has spoken. I wont be playing here. Thanks! when i press withdraw it takes me to deposit!! so you can only deposit and cannot withdraw whats wrong with that!? 50% max profit? This is just a clone of primedice except seems pretty shady and isn't functional. These guys have been spamming in PocketRocketsCasino chat as well as Just-Dice chat trying to get people over there. The guy hasn't even bothered replying to some of the issues. This is pretty much a scam site. You are new here and have made just a total of 6 posts. 4 of them are in this thread saying Dicebet works great and looks great, while another post mentioning the site name and link. You must be really loving the site. It's probably just JayzMike's alternate account that is used to boost his own sites reputation. Site looks very similar to PrimeDice. Also judging by the posts here, it seems very buggy too.